Indian Coast Guard celebrates 34th anniversary on January 31, 2011. On this occasion Vice Admiral Anil Chopra, DG Coast Guard has declared Coast Guard’s theme for the year 2011 as ‘Committed to Serve – Making a Difference’. Here is the press release from Ministry of Defence (and photo on left) through Press Information Bureau. The Indian Coast Guard has been expanding and undergoing an all around development in both capacity and capability. Addressing a press conference on the eve of 34th Anniversary of Indian Coast Guard here today, Director General Coast Guard Vice Admiral Anil Chopra said that the state-of-art ships and aircraft are manned by competent and professional manpower, who takes pride in serving the nation and protecting its life and property. The theme for the year 2011 is ‘Committed to Serve – Making a Difference’, which aptly reflects the zeal and dedication of Coast Guardsmen, who are committed to the ICG’s motto ‘WE PROTECT‘. He said Last year, eight ships were commissioned into the service, and three more are expected to be inducted by Mar 2011. The service is expected to achieve an effective strength of about 200 surface platforms and 100 aircraft by 2018, which is clearly indicative of the emergence of a new, modern and far more capable Coast Guard. On the infrastructure front too, one District Headquarters, five CG stations and one air enclave have been established during 2010, and two more stations and a Regional Headquarters at Kolkata are being established by Mar 2011, he added. By the end of 2012, there will be a total of 42 CG Stations, 05 Air Stations and 10 Air Enclaves functioning from various locations along the coast. As far as manpower is concerned, through concerted efforts and planning, the Coast Guard has increased its sanctioned strength by about 1200 personnel during the year gone by. Many measures such as short service appointment for women officers and CPL holders, increase in number of recruitment centers, promotion of eligible subordinate officers, and special recruitment drives have been instituted, he informed. 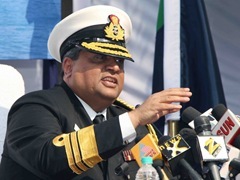 Vice Admiral Anil Chopra informed the media that in order to keep the EEZ and the coastline under constant surveillance, a major thrust has been accorded to operations, with 18-20 ships and 04-05 aircraft being deployed every day. Further, for enhancing the surveillance capabilities a Coastal Surveillance Network (CSN) along the coastline is being established. 46 such stations are being set-up under Phase-I, and 39 stations are planned under Phase-II of the scheme. He said that Search & Rescue operations within the Indian Search and Rescue Region are undertaken by the Coast Guard, round-the-clock. The dedicated efforts of the Coast Guard have saved 559 lives during 2009-10. A successful multi-agency, Maritime Search & Rescue Exercise ‘SAREX-10’ was conducted at Chennai in Mar 10. A total of 41 medical evacuations were also undertaken during 2009-10, he added. He further said that the pollution response operations undertaken for MV Chitra oil spill in Mumbai Port area in Aug 10, minimized the damage to the marine environment in and around Mumbai. The oil spill was dispersed by Coast Guard ships and aircraft, despite adverse weather and navigational hazards of drifting containers.